The Minomachi line (Nagoya Railroad Co, Ltd. a.k.a. Meitetsu) was a streetcar line from Seki to Tetsumeicho. The line, which was closed by 2005-Apr-01, was a single track line with the gauge 1067 mm and was electrified (600 V DC). These simulated routes for OpenBVE goes from Shin-Seki to Shin-Gifu and is used with the class 600, 880 or class 800 streetcars. The routes also uses the Tagami line and a small portion of the Kakamigahara line, the later which is electrified with 1 500 V DC. For that reason the streetcars used were equipped to also run on that voltage. 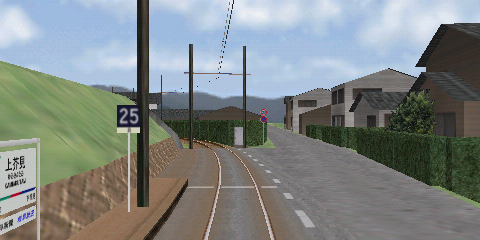 This is a well-made route with a lot of details trackside and in the urban environment where this line located. Between the stops in Kitaishiki and Ichinotsubo the graphic objects for the rails are misaligned at a couple of locations. Also there is a car parked to close to the track. The creator's website is gone from the internet.